1. This is a set of glasson marine-ply Geppys in the Hobie Fish template for Jay’s future 7-8 Kingfish. Pretty sweet, eh? 2. This is a 9.5″ Josh Farberow Flex fin for Jerry’s future 9-8 Nova. This is the fin he’ll use on those small days in South Carolina. My personal favorite for an all-around LB single-fin. 3. & 4. Here’s Jerry’s 2+1 set; a 7.5″ L-Flex with Hexcore Sidebites in FCS. Never know when those hurricane swells will kick up. 5. This is a new center fin for Dan’s 2+1 6-10 Mini-Nova. Dan wanted a little more hold on those bottom turns. I’m anxious to get some feedback from Dan on this fin. 6 & 7 This is a five-fin set for for Phil’s new Widget 3/4. He’ll use the CI template (7) in Hexcore when he wants to surf the board as a tri, or switch out the CI center fin for the two Hexcore TA sidebites (6) when he wants to surf the board as a quad. 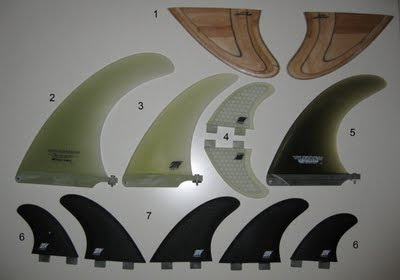 Using the combination of FCS plugs and Hexcore fins really keeps the weight down on multi-fin boards. Remember, buy a new Thomas Patrick surfboard and get 30% off on any new set of fins, leash or board bag.